The Triumph TR8 was an eight-cylinder version of the "wedge-shaped" Triumph TR7 sports car, manufactured by BL Ltd. and British Leyland. The majority of the TR8s were sold in the United States and very few genuine TR8s exist in other countries. 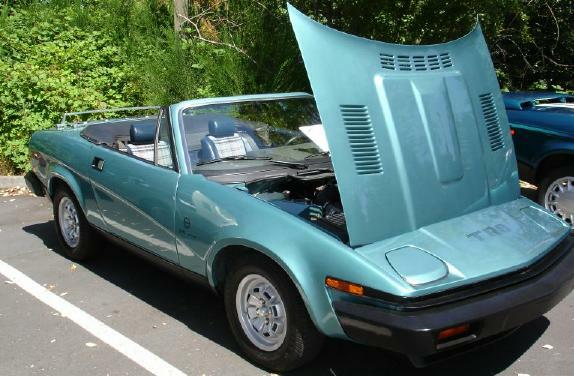 A V8 version of the TR7 was always planned, there is even a prototype as far back as 1972, but British Leyland's financial state and labor problems delayed the project. But by 1978 145 cars were built with V8 engines and usually automatic transmissions. These were tested by the press in the US then sold as used cars. In 1980, a Drophead (convertible) TR8 was added and all later TR8s were convertibles. It was made until October 1981. TR8s were initially fitted with twin Stromberg carburetors, but 1980 models sold in California and all 1981 models (of which only several hundred were produced) featured an early Bosch fuel injection system. The TR8 did not use Triumph's own single overhead cam V8 as found in the Stag due to an unreliable service record but instead shared its Rover V8 engine with the top Rover SD1. The engine itself was derived from an earlier Buick/Oldsmobile all-aluminum 215 cu. inch v8 unit. The carbureted model was rated at 130hp and the fuel injected at 137. Other differences between the TR8 and TR7 are upgraded brakes, revised axle ratio (3.08:1 on the TR8), battery moved to the trunk, alloy wheels, leather steering wheel and a few minor trim changes. In North America, the TR8 sold for around $11,000.